Oban is the frontier between the West Highlands and the Islands; the meeting place between land and sea. A perfect, sheltered harbour makes it the principal seaport for the Isles and the capital of the West Highlands. It has a mild, temperate climate, warmed by the Gulf Stream and washed (too often, some might say) by the soft rain that often falls hereabouts. This misty, briny character, with a background of heather and peat, is perfectly echoed in the malt whisky produced at Oban. 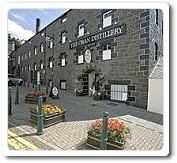 Fine single malt whisky has been made here for over 200 years, in one of the oldest licensed distilleries in Scotland. and taste. The result is the smoky, malty dryness in the flavour and finish of Oban™. The stills used are among the smallest in Scotland; the cramped nature of the site is attested to by the odd position of the worm tubs, fed by unusually short lyne arms, and nestled in the ‘vee’ between the roofs of the still house and an adjoining building. Food suggestion: Oban™ is simply lovely with chicken satay or even crystallised ginger. Taste style: Medium. Quite malty and sweet opening, with a medium body and a generous dry finish. A hint of spiciness perhaps, and seashore on the nose. A bustling seaside resort has grown up around Oban ™ distillery in the two centuries since it set up home in a fishing village. The West Highland malt is still produced in the same unhurried, traditional fashion. malt or even a whole anthology of highly individual single malts, chosen to represent each of 27 distilleries’ distinctive but authentic whisky signature. Each distillery is represented in The Managers’ Choice by a bottling of its single malt whisky drawn from one single cask, selected after a careful examination of distillery stocks. The cask was nosed, tasted, discussed and finally chosen as the most distinctive expression of that distillery’s single malts by a judging panel of acknowledged experts, including leading maturation experts and the distillery managers themselves. 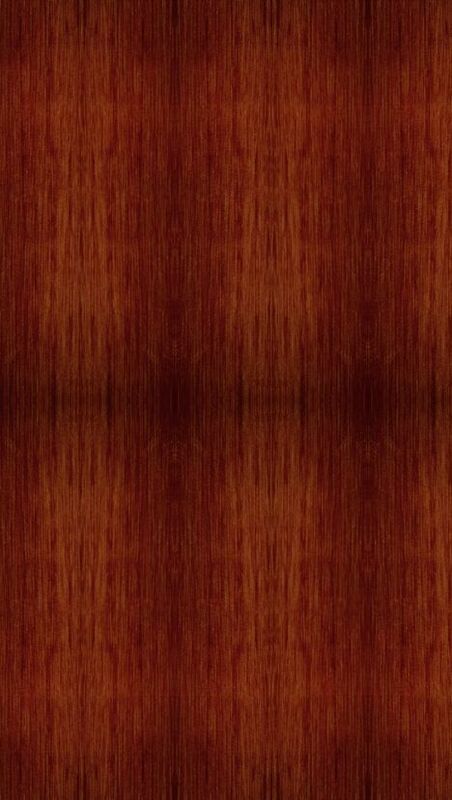 In many cases, unusual cask woods will have had their influence on the final result. Perfect maturation and spirit quality have been the criteria, resulting in a bottling that delights with original and sometimes unexpected flavours whilst allowing the distillery character to still shine through. Depending on the size of the cask and the rate of evaporation over the years since it was filled, the volume of bottles obtained can vary between approximately 600 and as little as 200.These are, consequently, extremely rare and distinctive whiskies. Once picked, each cask is bottled at its natural cask strength. Nothing is allowed to affect the natural taste and aromas of the whisky. This means that the liquid the connoisseur pours into his or her glass is exactly as it emerged directly from the cask when it was hand-picked a few months earlier by the experts - it's as good as a dram drawn from the cask in the warehouse itself. 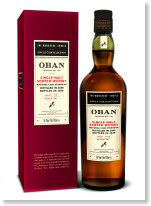 USA Buyers: Click Here for Complete Selection of Oban! Europe/Asia Buyers: Click Here for Complete Selection of Oban! Oban distillery is one of the oldest in Scotland – and it is physically and spiritually at the heart of Oban: the "Gateway to the Isles." In effect, the town grew up around the distillery and since its foundation in 1794 it has played an important role in local life. Distillery owners and managers to the present day have embraced this tradition of community involvement and hospitality - a tradition that came naturally to John and Hugh Stevenson, founders not only of the distillery at Oban but of the town itself. They were local men - their mother had come from Port Appin upon the death of their father, a stone mason. Both learned the stonemason's craft. Hugh opened a shop selling whisky and later took over slate quarries. His brother became a farmer, architect and builder. Together they established a boat building yard and a tannery and, in the 1790s a brewery, which had become Oban distillery by 1794. Two further generations of Stevensons continued the family's business interests in Oban. Hugh's son, Thomas, who had been farming in Buenos Aires, returned and purchased the distillery and the slate quarries from his father and uncle's trustees. Later he built the Caledonian Hotel, but, alas, he ran into financial difficulties through supporting his brother in a printing business in Edinburgh. He attempted to satisfy his creditors by supplying them with slates and whisky. His son, John, who had been living in Peru, but who returned and took over the running of the distillery in 1830, helped Thomas. He managed Oban until shortly before his death in 1869, when it passed out of the family. In 1883 J. Walter Higgin bought the distillery. Between 1890 and 1894 he dismantled and rebuilt it bit by bit, in order to keep it in production - such was the demand for Oban's malt. He carefully replicated the famously small stills and other traditional features in order to preserve the quality of the whisky. The distillery buildings and their internal arrangements are substantially the same today as they were following Higgin's refurbishment. Until recently only very exceptional malts were bottled and sold as 'singles'. By contrast, Oban™ has been enjoyed as a single malt since the 1880s. Interestingly, during the refurbishment in the 1890s, a remnant of Oban Bay's ancient beginnings was revealed when a cave (which has now been resealed) containing Mesolithic human remains was discovered behind the distillery. Oban distillery is currently working on a new visitor experience where visitors to the distillery will explore exactly what happens in the process to produce Oban single malt's unique spirit character. Together the guide and the visitor will explore each part of the whisky making process, to discover which flavours come from which parts of the process. During the tour visitors will be able to nose the new make spirit, and be given the oppertunity to enjoy some cask strength Oban straight from the cask. Monday to Friday, 12.30pm - 4pm. Monday to Friday, 10am - 5pm. Monday to Saturday, 9.30am - 5pm. Monday to Friday, 9.30am - 7.30pm. Last Tour is ONE hour and 15 minutes before closing. Adults: £7.00 and £3.50 for kids. A gift will be presented to every visitor during the tour. This charge includes a discount voucher, which is redeemable in the distillery shop towards the purchase of a 700ml bottle of single malt whisky. Admission is free to all Friends of the Classic Malts. Oban 14 yr unavailable in Utah and Wyoming, retailers say it is discontinued, is that a temporary seasonal thing or long term? Simply one of the best...cant get enough of it. A rare ribeye steak and Oban&#039;s straight up. Truly a gift from God. has any one had black oban befor and if so do you know where to get as well the name of it my dad 50 is cominf up and he has talked about this as long as i can remeber. Costco had Oban as of 8/1/2012. I did not buy any when I saw it in the checkout line in front of me. Thinking of going back to get a bottle. I think it was under $50, cheaper than it had been at the distillery in Oban.